With the winter season well and truly upon is you may be thinking that the team building season is over, but we are here to tell you different. Although this may be known as the off peak season there are still some great team building activities that you and your team can get involved with. 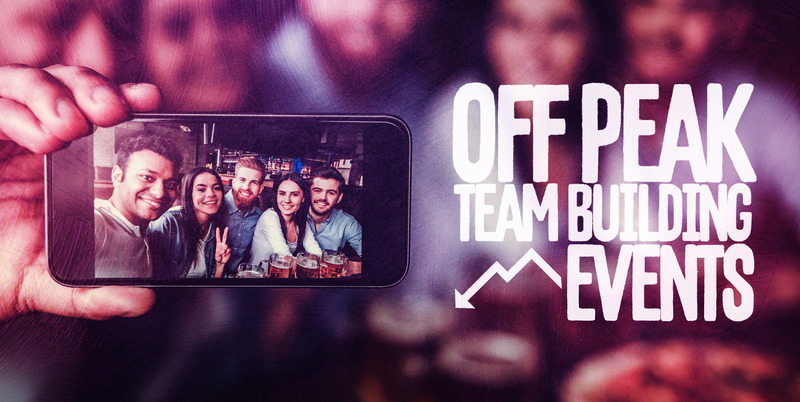 Whether you are wanting to boost team morale during this period or you just want to treat your team after a hard year of work we have got 4 great off peak team events for you to consider as the new year draws in. If you have a team full of foodies, then the Pizza Making Team Building activity will be the perfect chance to get your team out of the office and into a totally new environment. And we are sure they would all love the chance to toss their own dough and put together their own pizza with all the toppings they like. It is a great opportunity to show that as a team you can all have some well-deserved fun together even out of work. Sometimes the festive period calls for a team night out and what better way to start your night out than with the Cocktail Making Team Building activity? It is a hugely popular activity that the whole team will love. An opportunity to experience what it is like to work behind the bar, everyone can get involved as well as you all learn the basic skills of mixology in this busy and vibrant environment. Totally different to the office we are sure. It is great finding a team event that will get everyone stuck into a fun experience. And with the Pub Olympics Team Building activity that is exactly what you will get. Totally chilled out and informal, this activity will get everyone involved in a variety of unique games like giant jenga, air hockey, table tennis, Nintendo Wii, bar skittles and loads more. It is definitely the perfect activity if you are wanting a fun experience for your team to get involved in. And finally, we have a new activity that is perfect for this time of year and that is the Smartphone Christmas Treasure Hunt Team Building activity. Give back to your employees during this festive period with this excitingly fun activity. It is a unique twist on the popular smartphone pub treasure hunt that will get you all exploring the city and answering pub trivia including festive facts and questions and everything in between! And if these activities aren’t taking your fancy then don’t worry, we still have loads of other team building activities for you and your team to get involved with.